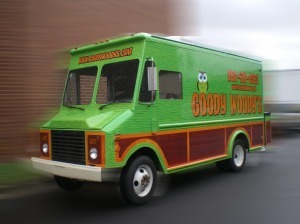 Are you looking for a Food truck wraps or a restaurant trailer wraps? Are you exploring the the Food Truck Wrap Cost? The Restaurant and Food Truck Industry is very competitive. As a restauranteur you offer multiple products for the inside and the outside of your restaurant. From scene-setting table graphics and interior wall wraps to interior and exterior point-of-sale graphics, we have a wrap for almost any surface. Let us help you achieve the look-and-feel you desire in your restaurant. We even offer Box Truck Wraps. We have it all, food truck wraps best design that you will find, we have your food truck wrap template, and great food truck wrap ideas! Savvy restauranteurs are always looking for ways to outpace the competition—without outspending them. 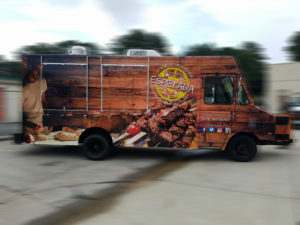 One often overlooked marketing tactic is vehicle wraps—Kranken Signs can cover your restaurant and Food Truck vehicles with eye-catching, professionally designed graphics that brand and promote your business. Let us create mouth-watering graphics that sell your products and services. Unlike more costly media, food truck wraps work for you 24/7, 365 days per year, for up to five to ten years, making the actual amortized investment manageable for most small businesses—a few cents to a few dollars per day, by most estimates. Strategic and creative versatility – food truck wraps can be used for long-term advertising or short-term product or event promotions—plus, you control the style (full or partial wrap), the design, and when wraps are updated or replaced. Local targeting – driving (and parking) a wrapped vehicle around your local service area can dramatically increase awareness among those who live, work or attend school nearby; parked vehicles attract the attention of pedestrians, especially in a busy urban setting, but also at local sporting or cultural events, colleges, conventions and tradeshows. Brand consistency – food truck wraps help unify a campaign’s look and feel because they incorporate the same branding elements from your other marketing channels. The food truck craze is sweeping the entire nation, and more food trucks are popping up every day. 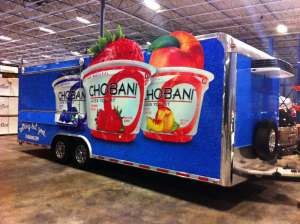 With the increased competition your food truck needs to stand out when the vehicle is wrapped. 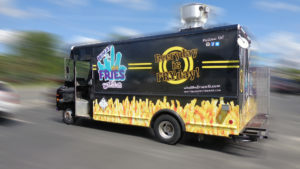 We can not stress enough how important it is to choose powerful and attention grabbing graphics so your potential customers can easily spot you at the next food truck Friday. As a Food Truck owner we highly recommend that you opt for full vehicle wraps for your food trucks, but if you need to save money you can get away with having two side panels and back panel wrapped for a semi-partial wrap. Food trucks need to be extra careful to pay attention to design because much of your business is determined by first impressions of your potential customer. Decisions to buy happen in only a few seconds at food truck festivals. When designing your food truck wraps and graphics, first make sure it is consistent with your marketing materials and website. Second, make sure that your contact info and social media addresses are clearly visible. If drivers on the freeway like the look of your truck and want to find you, they’ll need to quickly see how they can follow you on Twitter and Facebook, so make those clearly visible. Lastly make sure the design of the wrap will not be misconstrued when the food truck is in business. Don’t put key graphics on panels that will be opened up and not visible to customers in line or passing by. Typically these food trucks have a lot of small doors that open, rivets, and trim/molding that we have to pay special attention to detail on. 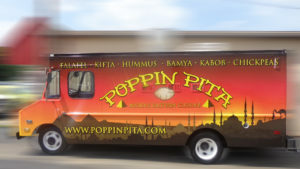 Having a unique and visually powerful food truck design is important for food truck branding and will catch the eyes of customers. Call us for a Food Truck Wrap consultation today.